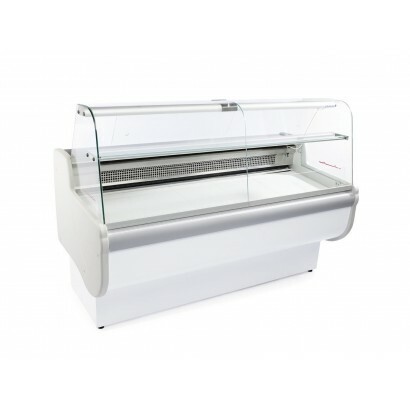 Serve over counters are ideal for fresh produce such as meat, dairy, sandwich fillings and deli items. 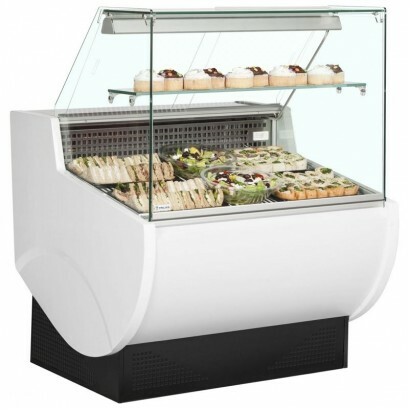 Our range of serve overs are available in curved or flat glass display options, as well as the choice between a slimline, mobile, counter top, low glass or self serve design. Choose from well known and respected commerical brands such as Infrico, Mafirol and Frilixa. Can't find the serve over counter for you? Call us today on 0161 442 9174 and one of the team will be happy to assit you in finding the right product. Here are introductions to the different types of serve over counter that we offer. 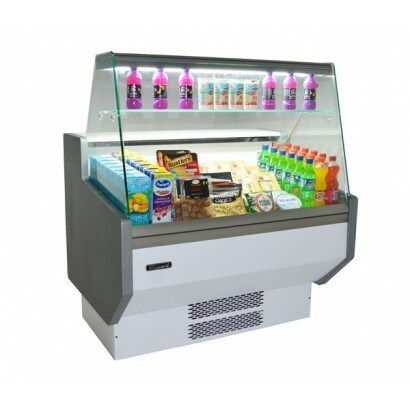 If you want to put products on beautiful display despite restricted space, you can choose one of our counter top units. 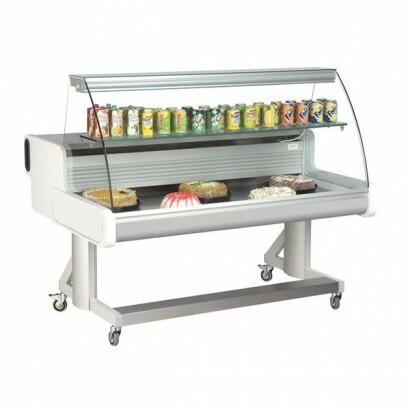 You could place it on an existing counter, making it ideal for mobile catering. 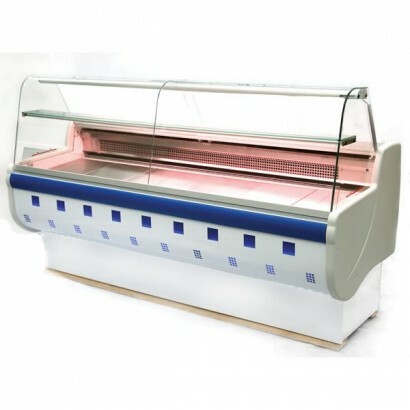 The curved glass displays of these counters can employ some style while making your products more visible. 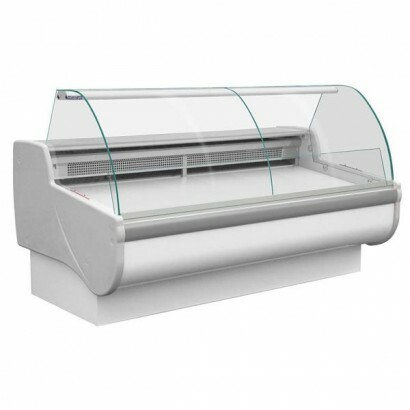 We have carefully chosen curved glass counters in various sizes and designs. 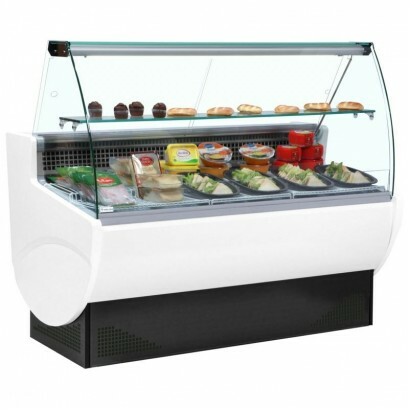 A flat glass counter from our broader stock of serve over counters can make your products more visible and, therefore, encourage more people to buy them. Top brands are represented here. 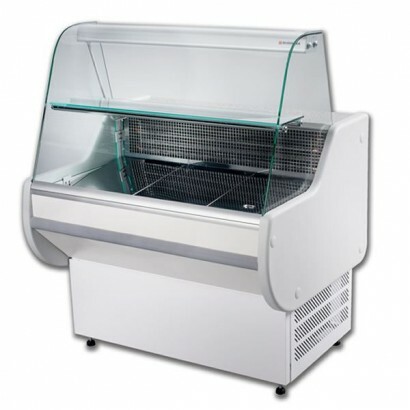 A butcher's shop can use one of these meat temperature serve over counters to display their fresh produce to the best possible effect for encouraging sales. Delis can also benefit from these counters. 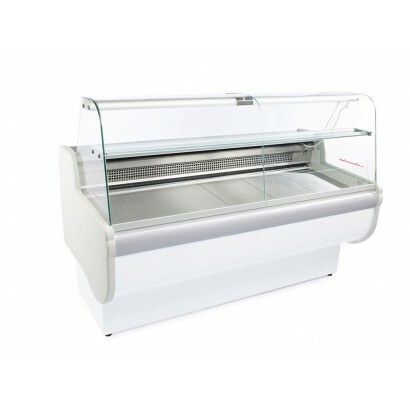 Whether you want to display meat, fish, or general chilled produce, these mobile display counters can be beneficial. 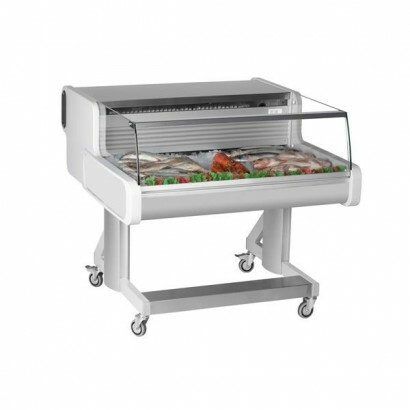 Befitting their name, they can also be easily transported for external catering. 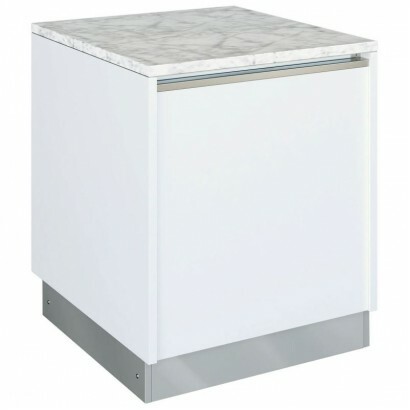 Each of these slim-bodied counters can fit through a doorway of standard size. However, plenty of these counters also come with a large display deck that maximises the cabinet's interior space. 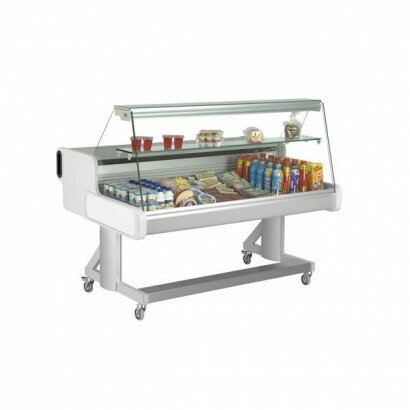 Counters of this type that we stock integrate a chilled display cabinet and a large counter top on which scales, tills, or further displays can be placed. Therefore, they are especially suited to takeaways and newsagents. 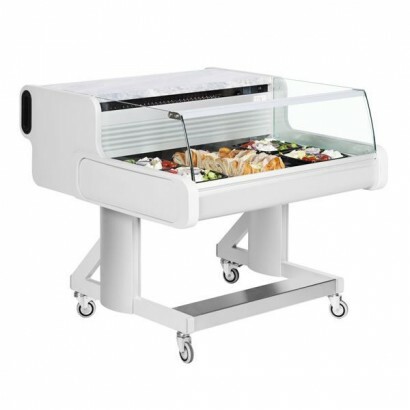 The Bellini Table range fits with the serve over counters in the Bellini range to create your desire.. 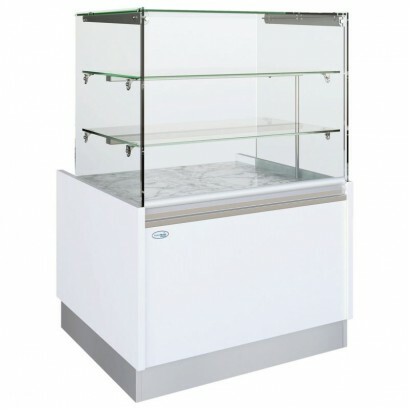 The Frilixa mobile serve over counter with low glass front is available in three cabinet sizes all w.. 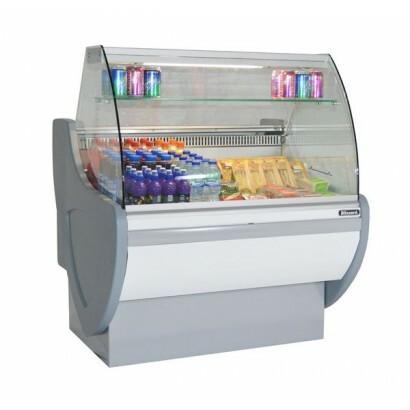 The Frilixa Celebrity Flat Glass Mobile Counter Display is able to be both a mobile counter display ..
A 1.0m curved glass serve over ideal for the display of drinks snacks, sandwich fillings or chilled .. 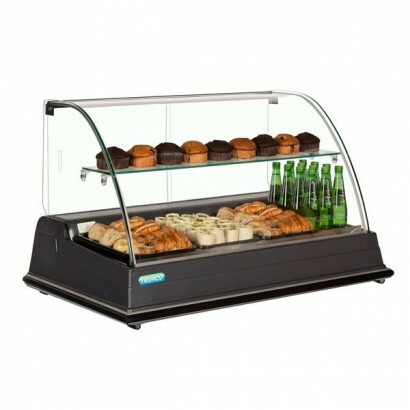 The Frilixa Celebrity Curved Glass Mobile Counter Display is ideal as a mobile serve over counter or.. 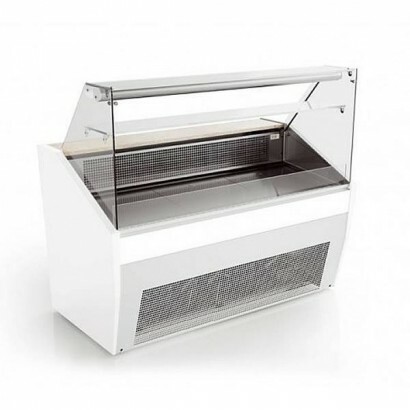 The Bellini Tower fits with the serve over counters and table in the Bellini range to create yo..